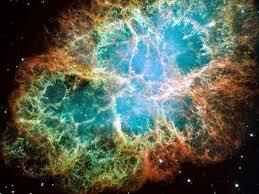 A supernova is a violent explosion in which certain stars end their lives. The very existence of a star relies on a complex balance between gravity and the radiation pressure arising from the star’s center. When the scale tips to the side of gravity incredible energy is released and the star explodes. There are two types of supernovae. Type I super novae are the result of the transfer of mass within a binary system that is made up of a white dwarf star and an evolving giant star. A white dwarf is a small compact star generally about one tenth the size of the Sun. It is the final stage of life for all low-mass stars. It’s potential to become a supernova occurs when the white dwarf orbits around a larger star. The two eventually move close enough that the gas and other matter of the large companion star transfers to the white dwarf. The mass and gravity of the white dwarf increases to such a degree that it becomes unstable and collapses. This collapse releases tremendous amounts of energy. Some of the star matter blasts outward in a supernova explosion. The remains of the white dwarf crash inward forming a black hole. Type II supernovae are huge single stars that die in a very dramatic way. As young stars they generate energy from the conversion of hydrogen to helium. As the star ages (millions of years) this hydrogen source is depleted. The star’s core contracts under the pressure of gravity raising its temperature high enough to burn helium as fuel. Once depleted of helium the star’s core contracts again. Paper Masters writes custom research papers on Supernova and examine these huge stars in the cosmos and how they are formed.